Uploading with FTP can be accomplished with a variety of both freeware and paid software. If you need an FTP client in order to access FTP services associated with your account, we recommend using the FileZilla Client (download it for free at http://filezilla-project.org). When downloading FileZilla ensure that you download the Client version and not the Server version. Use the following installation instructions to install FileZilla Client application to begin uploading with FTP. The connection dialog will appear in the window directly below the QuickConnect login bar. Once connection is established, the remote FTP Account files will appear in the windows on the right side of the screen. 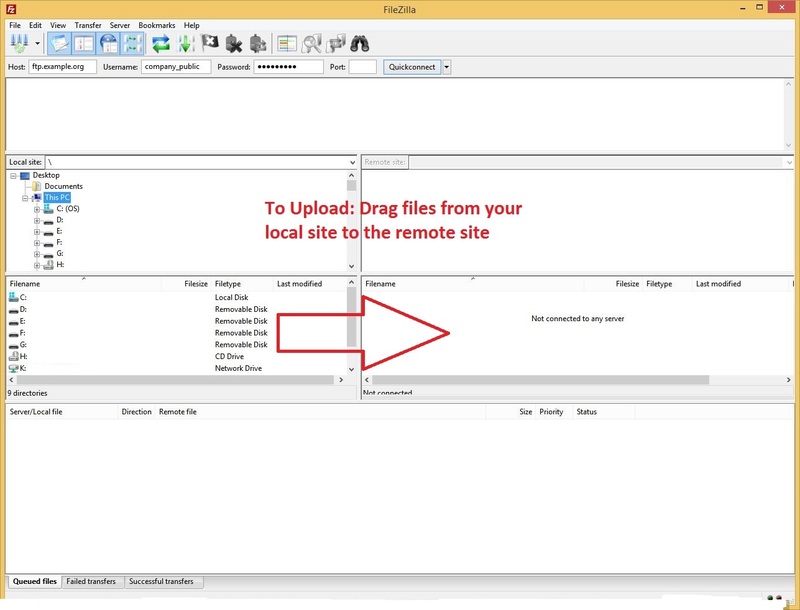 You can also add your account using the FileZilla site manger so that your connection preferences are saved (including default local/remote directories) by clicking File > Site Manager > New site and using the same settings as you used above.